Here are some posters for SSW Week, which is March 4-8th. 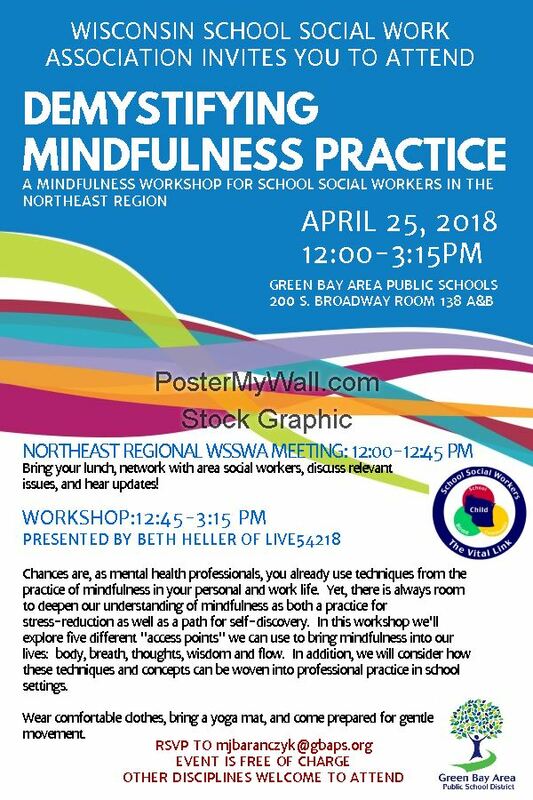 A mindfulness workshop for School Social Workers in the Northeast Region of WI. Bring your lunch, network with area social workers, discuss relevant issues, and hear updates! Chances are, as mental health professionals, you already use techniques from the practice of mindfulness in your personal and work life. Yet, there is always room to deepen our understanding of mindfulness as both a practice for stress-reduction as well as a path for self-discovery. In this workshop we'll explore five different "access points" we can use to bring mindfulness into our lives: body, breath, thoughts, wisdom and flow. In addition, we will consider how these techniques and concepts can be woven into professional practice in school settings. Wear comfortable clothes, bring a yoga mat, and come prepared for gentle movement. Celebrate School Social Work Week, March 4-8th! Please read the information about candidates in the link below prior to making your decisions. Please vote for 9 of the 11 possible candidates. Vote for each candidate ONCE. Selections for candidates will be in no particular order. Members are selected for a 2 year term beginning the Saturday after the Fall Conference, November 10th, 2018. Voting ends October 29th, 2018 at midnight. Apply for a grant for $100-$500 for a project idea that impacts student and family needs. Have a new idea or initiative you would like to try? Let WSSWA support you! For more information, click here. Application here. Please register for our fall conference, taking place November 8-9th at Green Lake! Registration form here!